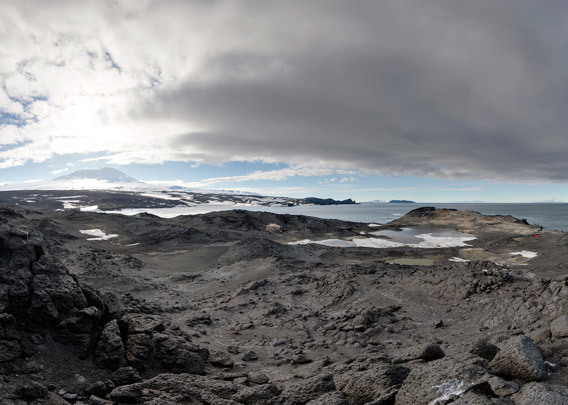 Cape Royds is in McMurdo Sound, deep in the Ross Sea. 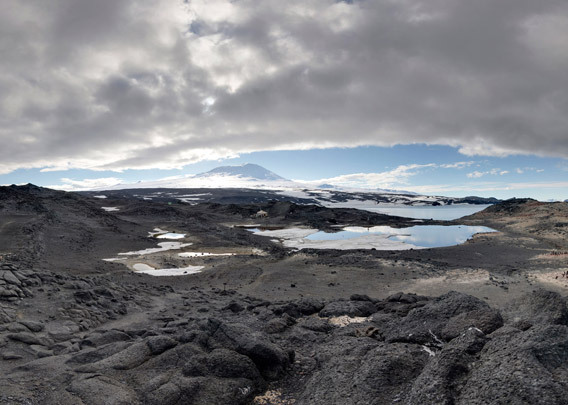 It is a little cape on the western side of Ross Island, on the foot of the famous volcano Mount Erebus. The first ascent of Mount Erebus was achieved during the Nimrod-expedition. All rocks are of volcanic origin. 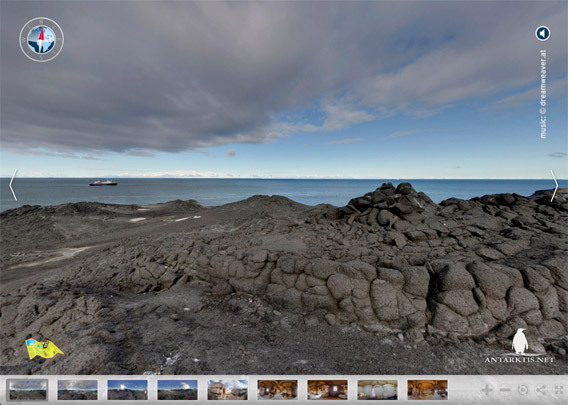 In clear visibility, you have got a good view over McMurdo Sound towards the Transantarctic Mountains. Here, on 77°33’ south and 166°9’ east, nothing is growing anymore. Biologists may be able to find some lichens with the magnifying glass, but the landscape is completely barren. But there is life at Cape Royds. It is home to the southernmost Adelie penguin colony anywhere. For the early explorers, this meant a reliable source of fresh food during the summer. Additionally, the lake (Pony Lake) provided fresh water during the summer, at least for some time and at least for the ponies. Fresh water supply can be a problem in Antarctica, especially when you have got horses! 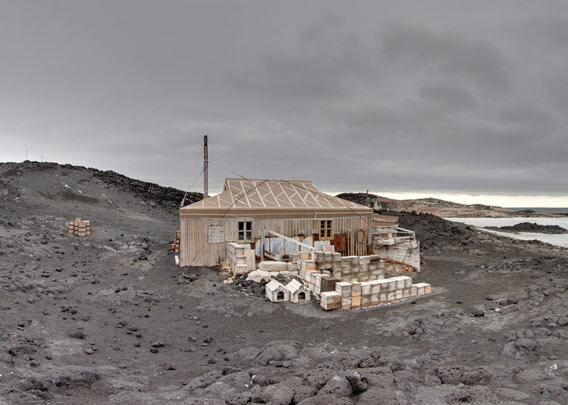 We are slowly getting closer to the famous hut that was built during Shackleton’s Nimrod expedition. 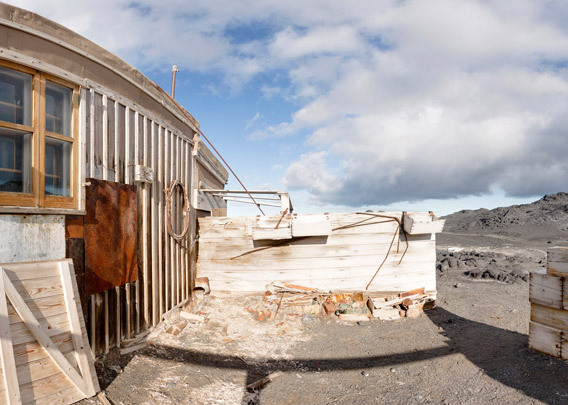 The ship Nimrod reached Cape Royds in early February 1908, after Hut Point further south had turned out to be inaccessible due to ice. 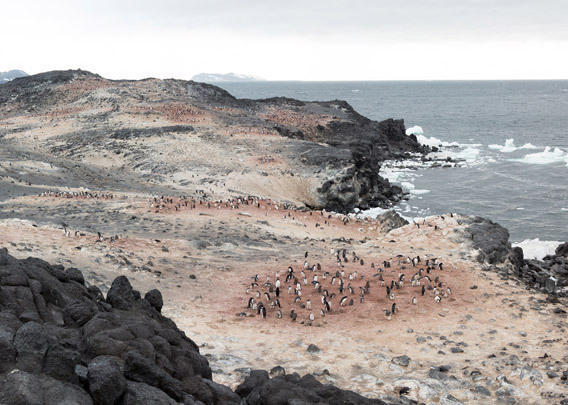 Hut Point was the site used by Scott’s Discovery expedition, which Shackleton had been a member of. There is a thermometer hut some metres away from the main building. Now we are some metres northwest of the hut, with a good view of Pony Lake. The northern side of the hut, which we can see from here, is enlarged with walls built of provision boxes. This part included the stables for the ponies, the kennels and the garage for the „car“. Which was not a great success. A closer look at the stables, where the ponies wintered in 1908. Only four out of ten ponies survived until the southern party, consisting of Shackleton and three more men, started their voyage towards the pole in late October 1908. The men reached 88°23’S, a position within 100 miles from the pole. Lack of provisions forced them to return from there. None of the ponies had made it to that point or anywhere near it. Most had died before the southern party had even started, some because of eating volcanic sand at Cape Royds. The last surviving pony out of the four that joined the southern party was called Socks. It died when it fell into a crevasse on the Beardmore Glacier. Now we have entered the famous Nimrod hut. 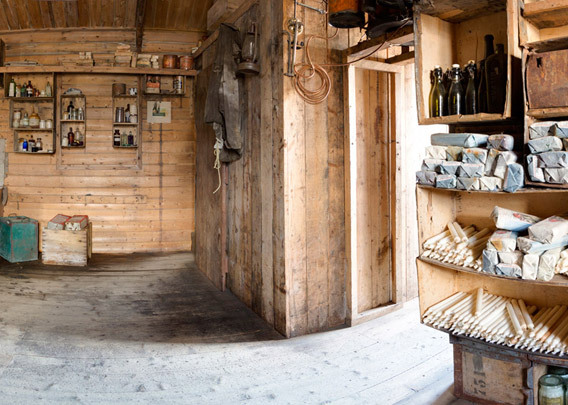 It is one of the four famous historical huts in the Ross Sea. The others are the Borchgrevink hut at Cape Adare, Hut Point (Scott/Discovery) and Cape Evans (Scott/Terra Nova). 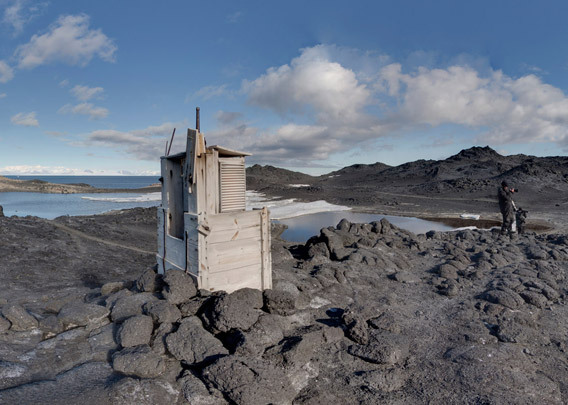 Compared to the Terra Nova hut at Cape Evans, the Nimrod hut is smaller and simpler. 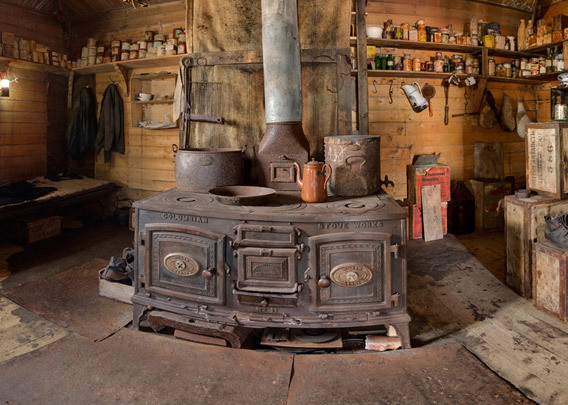 Geologist Douglas Mawson had a laboratory in the entrance area, but it was usually too cold to be used. Almost all of the 13 winterers slept in the large main room. The bunk beds were separated by thin walls to create an idea of privacy. These walls were removed later. In contrast to, for example, Scott’s expeditions, no difference was made between officers and men in daily life. 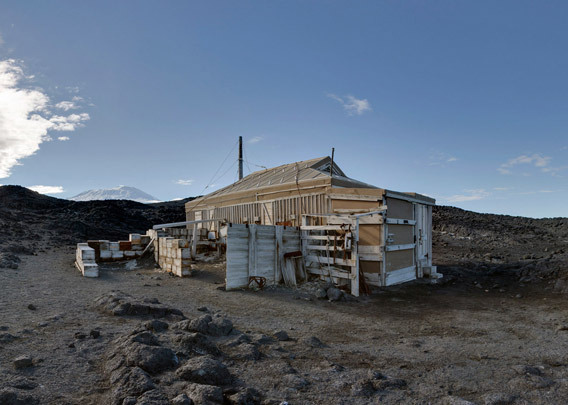 The hut was 10×5.8 m large, not a lot to house 13 men for an antarctic winter. 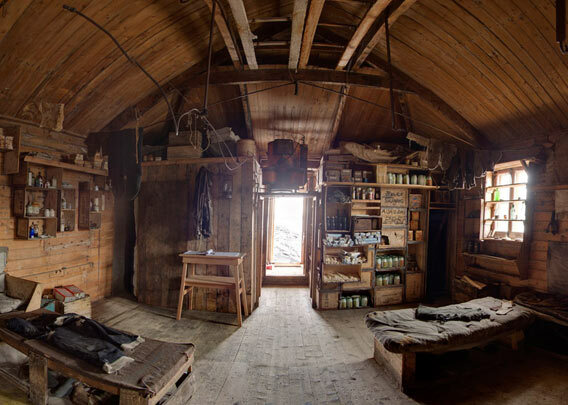 Shackleton had a little room for himself, which he readily offered to others if there was a need. Philip Brocklehurst retreated there to rest after parts of his toes had to be removed following the ascent of Mount Erebus. 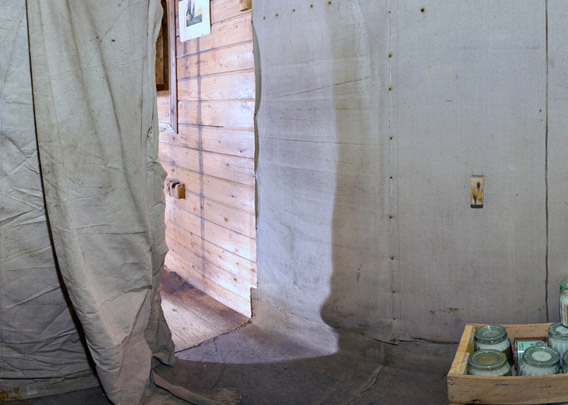 The room was under renovation when this panorama was shot (2015). Maybe I get a chance to do it again when it is brought back to its original condition? This is where daily life took place: the large oven kept the hut warm, this is where meals were prepared, there is a little kitchen area nearby. Biologist Murray had a little laboratory behind the oven. 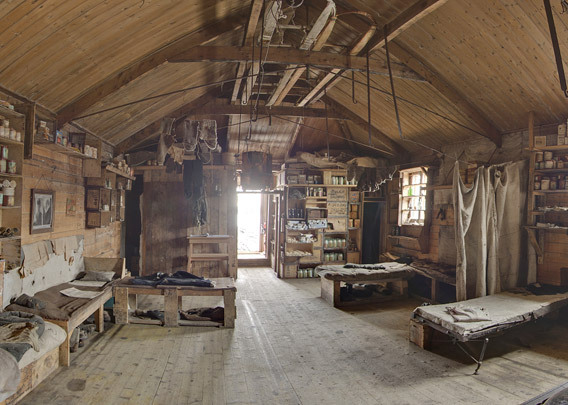 There are many artefacts still in place, giving a good impression of the conditions of daily life during the days of the Nimrod expedition, including the sledges hanging under the roof. 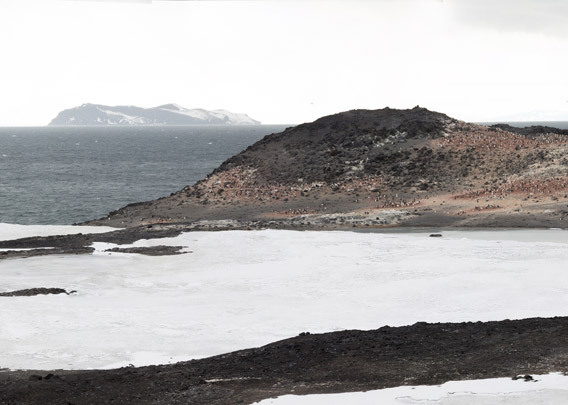 First some impressions of the scenery at Cape Royds in McMurdo Sound. 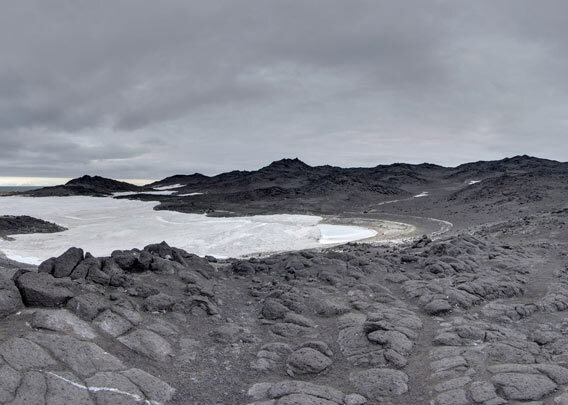 It is a rather dark, even slightly erie, scenery and atmosphere there under Mount Erebus, at least on an overcast and windy day. How often do you have a clear, blue sky in McMurdo Sound? The Adelie penguin colony at Cape Royds is, as far as known, the southernmost one anywhere. 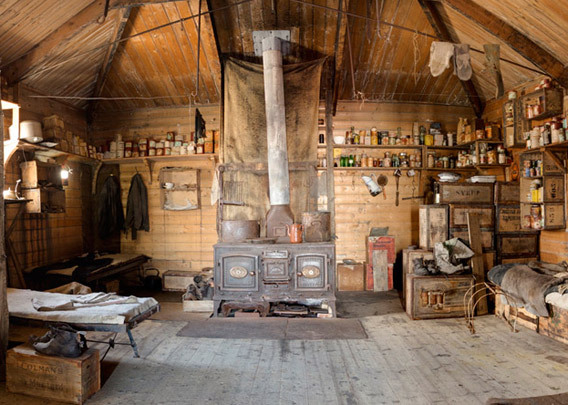 The hut at Cape Royds on Ross Island was built in early 1908 during Shackleton’s Nimrod expedition (1907-09). In October 1908, Shackleton and 3 more men, amongst them Frank Wild, started their trek towards the South Pole, but had to turn around 180 km away from their destination due to a lack of provisions. One of the expedition’s other achievements was the first ascent of Mount Erebus. Shackleton would have preferred Hut Point further south as location for his basecamp, which would have given him the benefit of a slightly shorter distance to the South Pole, but the ice kept his ship Nimrod from getting there. Cape Royds was accordingly only second choice.